Rapunzel, Rapunzel, let down your long hair. And the fair maiden let her beautiful blonde hair flow down to the waiting prince who climbs up the tower to rescue his princess. 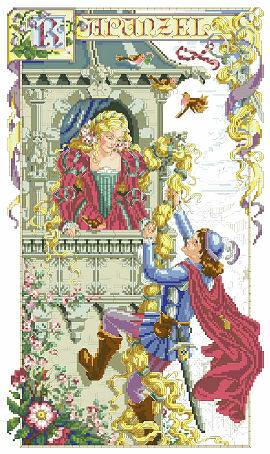 Sandy Orton has delightfully interpreted this classic fairy tale for you to work in counted cross stitch. One of three newly released princess designs, along with Cinderella and Sleeping Beauty. Contents: Stitch Count 140w X 239h, Finished size on 14ct: 10" x 17"